Of course, we Orthodox Christian parents want to bring our children to Christ. We bring them to be baptized, they are present with us at the Divine Services, they receive communion regularly. Isn’t that enough? No, we are still holding them back if we are waiting for them to absorb Orthodoxy by osmosis. Their bodies may be in the church, but their minds and spirits are far away. They come into the presence of the Lord but they do not know where they are or Who He is. Their boredom and restlessness should tell us this but, unfortunately, we often render ourselves oblivious to the messages the children are sending. We ignore their behavior, hoping that this is merely symptomatic of youthful ignorance and that time will take care of the problem. In fact, it will. When they are older, these children will leave the Church, a church of which they have never been made to feel a part. They will leave and we will be answerable to God for their departure. 1. We must instruct our children from the day they are born in Orthodox Christian life BY OUR EXAMPLE, in our every thought, word and deed. 2. We must concentrate, from their earliest childhood, on teaching our children basic civilized behavior, without which any further education, either secular or religious, will be impossible. This is not at all complicated or difficult. The key is consistency. Now, let us proceed to examine how we can apply the above principles at a Sunday Liturgy. Please remember that Divine Liturgy is a culmination of all the prayer and worship that takes place in the home during the week. If Sunday is the only day your family gives a thought to God, do not be surprised if your children feel confused and out of place. They cannot be expected to put on a show of piety once a week. They only know how to act out of heartfelt belief and habitual prayerful expressions of love for God. Let that be our first example to them and proceed then to preparations for Sunday Liturgy. On Sunday morning, the family should get up in a timely manner, so that all can be properly prepared to go to Church. Large families sometimes find it difficult to have all the children washed, dressed, and brushed in time without a lot of nagging, arguing, and rushing around frantically trying to attend to last minute details. A little organization can go a long way toward a serene beginning to this holy day. First of all, have each child’s church clothes laid out the night before, already inspected by a parent so that there will be no last minute arguments about inappropriate, mismatched, stained or torn apparel. Children four years old and older can certainly dress themselves. Older siblings can help the younger ones. Good grooming is important, both from a spiritual and a psychological standpoint. Dress a child in playclothes and he will be prepared to play. This was once a guiding principle behind school dress codes and is a reason that many public schools nowadays are requiring uniforms. Little boys should wear suits to Church, just as the men do (or should). It is not necessary to spend a fortune. A hand-me-down or a thrift shop bargain will suffice as well a new suit to fix the idea in the child’s mind that he is wearing special clothing to a special place where he is expected to act like a man. Not only will the suit serve to instill in him a sense of dignity, but it will also restrict his movements somewhat so that sloppy, casual behavior is rendered far more difficult. Dress shoes go with a suit. Not only do tennis shoes look ridiculous on someone attired properly for Church, but they contradict the message (which should be reinforced constantly) that Church is not a place to play. Little girls should wear nice dresses and dress shoes. Even from infancy, their heads should be covered. Some people who are misinformed about Orthodox tradition may try to tell you that girls do not need to wear a scarf or hat until they are twelve. Perhaps this has become confused with the age children are usually confirmed into the Roman Catholic Church or they think that the head covering somehow signals to the community that the girl will soon be available for marriage. Whatever the source of the misconception, it has no basis in Orthodox tradition whatsoever. Girls and women should arrive at Church with their heads covered, stand throughout the service with their heads covered, and leave Church the same way. This is done for spiritual purposes concerning modesty and humility. Therefore, do not be misled into believing that the headcovering needs to be worn only when confessing or communing (another popular myth). Girls, no matter what age, should NEVER wear pants to Church (or anywhere else, for that matter). It is easy to fall to the mistaken idea that toddlers should be exempt from such a rule. Yes, they are cute and they crawl around on the floor but little girls are not puppies. They will grow up to be women, hopefully women worthy of praise and emulation. It is much better to train a child correctly from a very young age than to impose something suddenly at an arbitrary stage of maturity. The very fact that it is arbitrary and based on personal opinion rather than any teaching of the Church will create feelings of rebellion in the child for which you may have difficulty finding an adequate response. In any case, if your concern is primarily that the weather is cold, have the child wear leggings or tights under her dress. Boys and girls should be clean and their hair brushed. Even a very small child experiences anticipation and a sense of awe about an event for which they are being so carefully prepared. When a child is allowed to go to Church looking unkempt, dressed in whatever assortment of clothes that came to hand that morning, that child will look and feel like an afterthought – someone who had to be dragged along when the parents wanted to go to Church. No one should expect an “afterthought” to be terribly thrilled about the idea of attending services or to be very cooperative when he gets there. Another important aspect to be considered is that, fair or not, the child will judged by the adults at Church according to his or her appearance and treated accordingly. Warm approval and compliments from adults other than his parents can have a very positive and encouraging effect on a small child. He will not receive any such attention if it does not appear that even his parents think enough of him to do more than toss some wrinkled clothes at him in the morning. The tone of parental expectations and familial participation can be set during communion prayers before the family even leaves for Church. As at all prayer times in the icon corner, the children should be expected to stand quietly and reverently. Even very small children should be with their parents at this time because even if they do not understand the words of the prayers, they do understand the serious attitude of the parents. This will help to accustom them to particular behavior whenever prayer is being said, thus preparing them to be quiet and attentive in Church. Children who are old enough to read should be allowed to read some of the communion prayers. This will help them to understand that, as they mature, they will be expected to take on some of the responsibilities of adults. Spiritually, psychologically, and emotionally they will respond with enthusiasm to this invitation to become a contributing member of the family Church. Before arriving at Church, it may be necessary to remind the children that they are about to enter a holy place. Laughter and loud speech must cease before we even approach the Church, as it is inappropriate, disrespectful and may distract those already inside the Church. We should all enter quietly and reverently. The reason we get up on Sunday morning in a timely manner is so that we will arrive BEFORE THE SERVICE BEGINS. Showing respect for God, the Church, the priest, and the Church community, we thereby set a good example for our children to follow. Children should be taught from earliest childhood how to reverence icons properly. Their first act upon entering an Orthodox Church should be to reverence the icons in an orderly and pious fashion as they have seen the adults do. Parents should help very small children by holding their hands and going through the motions of making the sign of the Cross with them until they are able to do it by themselves. Small children should be watched carefully and guided as they reverence the icons. Left to themselves, many children who have not completely grasped the idea that these actions are serious will show off or make a joke out of making the sign of the Cross. They do this, perhaps, out of self-consciousness but it cannot be tolerated. A firm correction must ensue followed by a demand that the child make the sign of the Cross properly. If he cannot or will not obey, the parent should take the child’s hand and guide him through the proper motions. Candles are not playthings, lit or unlit. Neither are they teething- rings. Churches and monasteries purchase candles for a specific purpose – so that the people can light them and set them before the icons in remembrance of prayerful intentions. Once lit before an icon, the candle itself is considered holy and must be dealt with reverently. Children who are old enough and have shown a certain degree of maturity may be allowed to light their own candles before the icons, but only under the watchful supervision of the parents. If, however, the child makes a game of this, the privilege should be revoked until such time as he understands what he is doing. A note of caution is in order here. Candles are open flames which can cause injury to the child. Little girls with long hair are particularly susceptible to setting themselves ablaze. Always stand next to your child as he handles the candle because a moment of inattention on the part of the child (or the parent) can have serious consequences. Let us also refrain from sending bored children to “tend” the candlestands. The distraction often created by adults noisily blowing out candles and tossing them into a box is bad enough, but the effect is magnified when the job is undertaken by a child who craves diversion. After reverencing the icons and lighting candles, men and boys should take their places on the right side of the church; women and girls should stand on the left side. Of course, babies still small enough to be held comfortably should be with their mothers, but it is important that boys learn to stand with the men at a young age. Many people at first object to the idea of their family being separated during the Divine Services. They are accustomed to standing together at home when they pray together as a family. Because we are all one family in the Church, we have a responsibility to one another. Therefore, it is appropriate for other members to help look after small children who stray from their parents or who appear to be acting in rebellion to their parents’ wishes. This should not be interpreted by the parents as interference or someone passing judgement on their ability to control their children. It is well known that familiarity breeds contempt and that children will often mind a stranger rather than their own parents. This is also often necessary to keeping good order in the Church. Naturally, the primary responsibility for children’s behavior rests with the parents but if they are absorbed in the service and do not notice their toddlers playing at the candlestand or their older children slouching against the wall, it is perfectly appropriate for an adult or older child to intervene. Rather than be offended, the parents should thank those who care enough to take action. Once the service begins, our participation requires that we, as Orthodox Christians, stand, listen attentively to the service, and make the Sign of the Cross whenever Christ, the Holy Trinity, the Theotokos, or the saints are mentioned by name. Our children are also Orthodox Christians and we do them great spiritual harm when we do not teach them how to participate in the service. How tragic it is to attend Divine Liturgy and see children left to themselves to play in the choir loft or on the stairs, or stuck in a back corner somewhere with a pile of toys. This conveys a powerful message to the children that Orthodoxy is for adults only and that Christ and His Church are not concerned with children at all. This is untrue and unfair. They have been baptized and they need to be brought into the fullness of the worship.This is not necessarily easy, however. Toddlers can be especially trying because they become easily frustrated when their movements are restricted. At first, we may be able only to keep them within arm’s reach and quiet their louder outbursts. While we have to allow them a certain latitude, we must very clearly define specific boundaries to their movements and their behavior. All children (including toddlers) need and crave such boundaries. This defines their world and gives them a sense of security. If no boundaries are defined, a child will ultimately wander aimlessly throughout the church until somebody stops him. This is natural. However, this aimless wandering is unsettling for a child because he has no secure place where he can feel he belongs. So we set the boundary for the child close to us, within arm’s reach, so that we can effectively enforce the boundary. The boundary will be tested, we can be assured of that. The child needs to test his limits to verify that they are real. Expect any limit set to be tested many times. Because of this, consistency is essential. As many times as the child tries to wander, we must bring him back. Any time the child makes a loud disturbance, we must insist he be quiet. If he chooses to persist or become even louder, we must immediately take him outside and discipline him in such a way that he will connect going outside with something unpleasant. We should take note that rebellion does not always manifest itself in a noisy way. Silent sobbing and sullen disobedience are just as indicative of self-will as tantrums and just as spiritually destructive if not corrected immediately. Frankly, early rebellion is best dealt with by administering a spanking. As controversial as this subject has become, an explanation is in order here. A surprising number of parents have fallen for the trendy philosophy that spankings cause children to become hostile and violent. The fact is that most small children learn very quickly from situations in which pain is the consequence for wrongful actions. If they touch a hot stove, tease a grumpy dog, or shut their fingers in a door, pain ensues. They do not hate the stove or try to pick a fight with the dog. They simply avoid the action which led to the painful consequence. Spanking as a consequence to rebellion is therefore much more comprehensible to a small child than lengthy emotional appeals to their better nature (which has not yet been developed) or long periods of being ignored followed a furious pounding (which is not only abusive but confusing to the child). When a parent attempts to apply the method described above, he must expect a certain amount of criticism from other members of the community. For some reason, people want to see a well-behaved child without ever seeing the discipline applied. Some will say the parent is being too harsh, while others will complain that the child is unruly. We cannot expect to please everybody. We must set our own standards for our children’s behavior and hold them to those standards on a consistent basis. This approach will teach the children proper behavior and will ultimately gain them much praise when they begin to act like civilized human beings. The praise will be the more so because such behavior is so rare nowadays. Food should never be brought into the church in the form of snacks and drinks to keep small children quiet. (By the same token, teenagers should never be given gum to keep them quiet either.) For one thing, it is uncanonical. The only food consumed in the church is Holy Communion, Antidoron, and the Artos. The eggs for Pascha and grapes for Transfiguration are brought in only to be blessed. Other foods are forbidden by the canons. Besides, it is just not a good idea to bribe children with snacks. This teaches the child an unhealthy attitude toward food which can promote obesity and creates a bad habit which is very difficult to break. Imagine how difficult it will be to teach such a child how to fast for Communion and Antidoron when he is of age. School age children should be required to stand throughout the Liturgy, except at the reading of the Epistle and during the Homily. Standing does not mean leaning against the wall, slouching with hands in pockets, or hanging on to a parent (or anybody else). Children need to be standing reverently with their hands at their sides or folded in front of them. If the parent senses that the child is unwell or unusually tired, then it is for the parent to indicate when the child may sit down. We must not allow the children to make such decisions for themselves. This is an opportunity to train them in obedience. There is a world of difference between a self-willed child deciding that the service is too long and that he must take a rest, and the parent permitting a necessary rest. The key is who decides what is necessary. Orthodox spirituality is based in obedience, as manifested in the obedience of the Theotokos and each of the Saints. Even in the smallest acts, teachings of the Church are imparted to children. The same parental discretion must be used in allowing children to leave the church to go to the bathroom. Generally, it is a good idea to be sure that each child goes to the bathroom before entering the church. In most cases, noone should need to go again until the conclusion of Divine Liturgy. Children are very apt to use the excuse that they must go to the bathroom so that they can leave the church and play for awhile. In cases where the parent discerns a real need, the parent should accompany the child to and from the restroom to insure against any dawdling. This will also discourage any false alarms. Should the parent need to leave the church for any reason, the children should remain in the service under the supervision of the other adults there. In such cases, it should be understood that the other adults have the authority to issue corrections and administer discipline where necessary. Neither adults nor children should leave the church during the reading of the Gospel, the Great Entrance, or at any time during the consecration of the Gifts. To leave at these times is very disruptive and irreverent. Babies and toddlers should, of course, commune every Sunday and Feast Day and they require no particular preparation beforehand. By their demeanor, however, the parents convey their personal sense of reverence for the Mysteries to the child. As the child matures, the parents’ responsibility increases. When the parents and the Priest feel that the child is articulate enough and able to understand right from wrong, it is time to have the child go to Confession. There is no specified age when this should occur. Some local churches have arbitrarily chosen the age of seven, but this is merely a guideline and should not be considered absolute. Some children are able to confess at a very early age, while others may need more time. The same holds true for fasting before Communion. The parents should accustom their child to the idea, first of all, by their example. When the parents observe that the child does not seem to require food as frequently (for example, the child is able to play all morning without showing interest in food), they should help the child understand that we do not eat or drink in the morning before we commune. Again, this is a matter of parental discretion but our goal is to strive to teach the child to put off gratification of physical appetites in favor of a higher, spiritual good. It has been mentioned several times here that children must learn to move and speak reverently in the church. This must especially be emphasized when they approach the Chalice. In some churches, children are communed after the adults. This helps them to learn humility and respect for their elders. In whatever order the people are communed, however, children should not be allowed to push in front of others, fight among themselves, or in any way be disruptive. They MUST be made to understand that they are approaching God Himself and that those who partake unworthily (or with an unworthy attitude) do so to their detriment. Because parents risk taking this condemnation onto themselves, they should be vigilant of their child’s behavior at all times. Should the child misbehave as he is approaching the Chalice, the parent would do well to take him out of the communion line and not permit him to commune that day. Communion is a sacred privilege, not a right. The child will learn a tremendous spiritual lesson when he learns not to take this privilege for granted. The child should approach the Chalice silently, arms folded across his chest. He should open his mouth wide so that the Priest can easily put the spoon in the child’s mouth. The child should then close his mouth around the spoon and wait for the Priest to pull the spoon out. If some of the Mystery should spill on the child’s lip or chin, he should let the person holding the Veil wipe it off. After communing, the child should move to the place where the Antidoron is being given. There he should take one piece of Antidoron, dip it into the wine, and put it directly into his mouth, cupping his other hand under his chin to avoid spilling crumbs on the floor. If any crumbs do fall, the parent should consume them. A small child should wait for someone to assist him, rather than risk spilling the wine or knocking bread on the floor. Children should be told that Antidoron is holy and should be treated reverently. Until the child eats a full meal, he must not be allowed to put anything in his mouth which will be taken out again, such as his thumb, his pacifier, lollipops, or chewing gum. This is done out of reverence for any trace of the Mysteries which might remain in the child’s mouth.For the same reason, the child should be discouraged from spitting. Should a baby spit up after Communion, a tissue or paper towel should be used to clean up and then taken directly to the Priest so that he can properly dispose of it by burning. Children, as well as adults, should refrain from socializing until they are outside the church. If there is a place provided for children to play, now is the time. 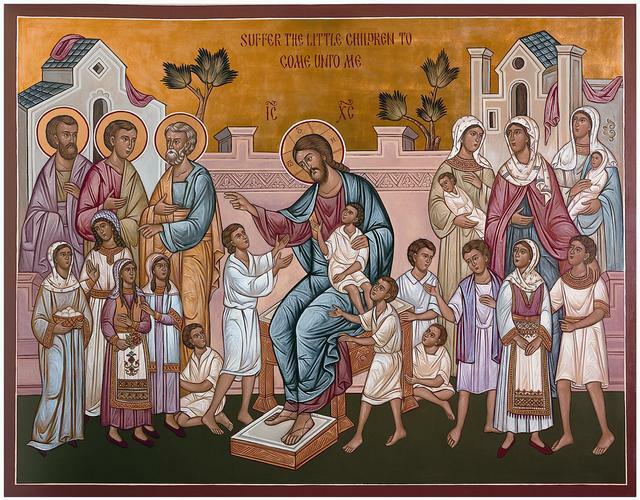 Children who have stood quietly throughout the Divine Liturgy should be praised for their good behavior and allow to burn off some energy before the Agape meal. There is a time and place for everything and just because we do not allow children to play in the church does not mean that we do not understand their need to play. If there is a meal at the church after Divine Liturgy, children’s good manners can make for a very pleasant social experience, while bad manners can make the meal difficult for everybody. If the food is being served buffet style, children should always be served after the adults. Small children will need their parents to make up a plate for them, but even older children may need parental supervision to be sure that they do not take more food than they can eat. Of course, nobody should take any food until the blessing has been given by the Priest. The parents should take responsibility to clean up any mess made by their children. Older children and teenagers should be encouraged to assist in serving the food and cleaning up after the meal. This will help them to feel that they are a part of the community. It is quite natural for parents to become discouraged when initial attempts at disciplining children appear to fail miserably. None of what has been written here can be accomplished overnight. There is no “instant” formula for teaching children reverent and civilized behavior. Patience and, above all, consistency are absolutely essential in attaining the desired results. This consistency must be based on a sincere desire to set a proper example so that we, the parents, demonstrate the best of Orthodox behavior. True Orthodoxy is reflected in a way of life which is practiced in the home on a regular basis. To have children live one way at home and then suddenly to expect them to act differently in the church is an unrealistic (and, frankly, hypocritical) approach. If, during the course of the week, the child has not been expected to stand quietly at prayers, act respectfully to his parents, and exhibit good table manners, why should we be surprised if he acts badly at church? There is no reason to be afraid to set high standards for our children. When we have high expectations, children not only gain self-esteem by meeting those expectations, but they come to love and respect those who set them. Children want the House of God to be a place of awe and mystery. Though young children may have difficulty being attentive during long services or understanding what these services mean, they yearn to be taught and naturally seek to understand anything for which their parents show a deep reverence. Traditional Orthodoxy is a priceless pearl, a gift which we bestow upon our children. If we act as though we are depriving our children in some way by insisting that they adhere to the teachings of the church, we are blaspheming. When we bring our children to Christ, we must not forget that we are bringing them into the presence of the King of Kings. We do no service to our children when we deprive them of the means of understanding this blessing. To give them the false impression that they are equals with their “friend, Jesus” is to give them a counterfeit Christ. We love our children and therefore we want to bring them to Christ as He truly is, in all of His glory. To give them less is to give them a stone in the place of bread. Our job as parents is to teach our children how to ask. As has been stated before, the child will do nothing at church which he has not learned at home. Children, not being hypocritical by nature, act according to what they have been taught by their parents. Curiously, parents are often unaware of what they have really taught their children until they see the results manifested in public. That is why this book began with the child at Divine Liturgy—with all the incipient problems highlighted. It is often easier to choose to blame the traditional Orthodox Church for making the church atmosphere uncomfortable for parents of uncontrollable children. But if we are honest with ourselves, then we are forced to take a hard look at our home life and our methods of discipline in order to find out where we went wrong. What most of us will find when we view our child-rearing methods through an Orthodox perspective is that we have allowed the child to develop a powerful self-will. We have come to expect disobedience rather than obedience from the child. Indeed, we have often conformed ourselves the child’s will, striving to mold ourselves to the child’s every whim and desire, desperate to win and hold the child’s love and approval. What’s wrong with this picture? It is a perfect photographic negative of what Orthodox family life is supposed to be. Black is white and white is black whenever we embrace worldly standards of parenthood. This also means that we are calling good (strict discipline and high standards) evil (repressive, fanatic) and evil (no discipline, low standards) good (“affirming”, understanding of “differently-abled” children). Self-will, once it is firmly established, is so antithetical to Orthodoxy that it will render spiritual growth impossible. It is the responsibility of the parents to impose their will upon the child, even in the smallest details, even in the seemingly insignificant areas of the child’s life. The will of the parents should be imprinted upon each step— of course in a general way. Without this, the behavior of the child can easily become corrupted. After enjoying himself according to his own will, the child always returns unwilling to obey even in the smallest things; and this if it happens only once—what then can one say if this part of bodily activity is completely neglected? How difficult it is later to uproot self-will, which so quickly seats itself in the body as in a fortress. The neck will not bend, the hands and feet will not move, and the eyes will not even wish to look as they are told. 1). The world revolves around me. My desires supersede those of my parents and they must act according to my will. 2). It is important that I never feel hungry or uncomfortable in any way. How could one expect such a child to respond to the idea of fasting when he comes of age? It is especially important that the child not connect the idea of “love” with the idea of “instant gratification.” Otherwise, all attempts at helping the child to grow spiritually will be greeted as frightening portents of abandonment. From very early childhood the child must learn that he will eat food given by a parent or permitted by a parent at the time decided by the parent. He will play when and where the parent decides. A child must learn from infancy to look to his parents for guidance and not to his own will. We must be careful here to note that overcoming self-will is not easy at all. We must expect to struggle and sometimes have unpleasant confrontations with our children. This can certainly be exhausting but if parents give in to their children’s demands, even once, spiritual ground is lost that is very difficult to regain. A child who cries in order to get his way, for example, will cry for everything once he finds that this method moves the parents to sympathy. This so-called “sensitive” child is merely a manipulator of the feelings of others. To cater to this kind of manipulation as though it were a touching character trait is to develop the child into a self- involved cry-baby who will be unable to “cope” with anything he chooses to avoid. The Orthodox family gets up in time to say their morning prayers together. If this means missing some sleep, bear in mind that it is not only a good spiritual discipline for the adults in the family, but a tremendous example to the children of where the family’s priorities truly lie. Of course, extenuating circumstances might render this schedule impractical. If a member of the household works nights, for example, he should be allowed to say his prayers later. Before eating or drinking anything, each member of the family should have some antidoron or a sip of holy water. By this act we remind ourselves that every good gift comes from Our Father in Heaven. When children begin each day with prayer and by partaking in holy things, they will be far less likely to associate piety and godliness as attributes to be considered on Sunday at Church. In our culture, breakfast is likely to be a hurried, informal meal. However, this is no excuse to forget either the blessing or one’s table manners. If the children are attending public school, chances are that they have picked up some fairly deplorable habits which must be vigilantly corrected. As with any other meal, complaints about the food must not be tolerated. The day should start with a nutritious meal but that does not mean that the mother must become a short-order cook catering to each individual whim. After breakfast, when various members of the family have made their way to work or school, the traditional Orthodox mother will find herself at home with her smaller children. Or, if she is homeschooling, all her children will be there with her. The children will not be at a day care center while she is at work because then we would not be discussing the traditional Orthodox home. Frankly, the concept of a mother dropping her children of each day at an institution in which a few underpaid employees attempt to supervise several children at once is antithetical to the idea of Orthodox homelife. The mother who wants to instill true Christian spirituality in her children must be there to see to it herself. Though cleanliness and orderliness in the home are important and should not be neglected, the Orthodox mother should avoid the use of television as a babysitter while she attends to household chores. No matter what the sponsors of children’s shows may try to tell us, there is very little on television which is actually instructive or substantial. The rapidity with which the images are shown have a mind- numbing affect on a toddler and afford them little opportunity for interactive play. Television does, however, become addictive and parents who indulge this addiction usually end up experiencing the very unnerving phenomenon of their small children demanding to see “their” programs and throwing tantrums when their demands are not met. Far more instructive is the constant verbal communication that should be taking place between mother and child. This is how a young child learns to speak correctly. If the child is allowed to play in the same area of the house where the mother is doing her chores, they can have a lot of positive interaction without the mother having to leave her tasks and devote her entire attention to the child. In addition, some time should be set aside for the mother to read stories and play games with the child. A mother is her child’s first and best teacher provided she does not turn her responsibilities over to the television set. This is also a good time to introduce children to concepts of beauty and harmony, particularly in the area of music appreciation. Without worldly biases, small children inately love that which is lovely. Peaceful and intricate melodies not only calm babies and small children but help them to form a preference for that which is beautiful. As the child grows, he will come in contact with cynical peers who identify their world view with nihilistic noise. The best protection an Orthodox parent can offer is to instill in the child a love of beauty and a belief in good, as embodied by the Orthodox Church and expressed in many ways by those who love God. 1) Firmly insist that every command she gives to the child, even the seemingly least significant, be obeyed. If obedience is not forthcoming, there should be immediate and unpleasant consequences. A mother who sighs and smiles after such a transgression, saying, “I just can’t get him to do a thing I say,” has abdicated her responsibility for the child’s soul. 2) Teach the child to respect other people’s property. This may mean that the mother will find herself endlessly repeating, “Is that yours? No, that is not yours. Don’t touch.” This will not only help instill a certain humility in the child (I am not the center of the universe. Everything does not belong to me), but it renders the child far more trustworthy in situations where he is not under constant supervision. 3) Teach the child to ask permission. Anyone who has visited an Orthodox monastery knows that the monks ask a blessing of the abbot before they do anything – begin their work, go out on an errand, take a drink of water. This not only helps the monks spiritually in accepting authority and acting in obedience, it helps the abbot maintain good order in the monastery. If a monk were to take food without asking, how would the abbot know whether the brothers had enough food for the evening meal? The same is true in the Orthodox household. If a child must ask permission before eating, then the mother knows how much food he has eaten and whether or not he might make himself sick by having more. If the child must ask permission before he goes out to play, the mother knows where he is and will not spend time franticly searching for him. Permissiveness is not kindness. A young child who has bonded to his mother from infancy desires to please her. His willfullness and rebellion do not make him happy; they are merely traits of fallen humanity. Some modern theories teach that it is wrong to make a child apologize when they have done something wrong. They surmise that since the child is not able to feel genuine contrition, we make the child into a hypocrite by forcing them to say what they do not feel. The baptized Orthodox Christian child does indeed feel the inner imbalance of his soul when he has sinned. He must be taught to recognize the source of that imbalance and to express the repentance that is necessary for him to be restored to harmony with God. In the evening, the family is reunited. The evening meal should be taken together. Sadly, our society has largely abandoned the concept that it is important for the family to come together in joyful fellowship at the end of the day. Frantic accommodation of various schedules, snacks taken in front of the television, grazing from the refrigerator — these have taken the place of meaningful conversation and the bonding of parents and children around the dining room table. Let it not be so for the Orthodox family. The hectic pace of life being what it is, the evening meal may be one of the few times we have during the work week to relax and enjoy one another’s company. This is where children learn how to make congenial conversation and have a chance to tell the important events of their day. It should be an opportunity for everyone at the table to talk about the things that interest them with the people they love most. This is not the occasion for the mother to tell her husband about the transgressions of the younger children, or for heated arguments of any kind, or for adolescent sullenness, or for complaints about the food. Informality within the family does not mean that we are free to be our rudest and crudest with those who must put up with us. It means we are free to express our love and interest in those with whom our lives are entwined. At whatever time is most suitable to bring the entire family together, we say our evening prayers. This may be followed by the daily scripture reading or a reading from the lives of the Saints. These are very beneficial for children as it gives them spiritual heroes to emulate. If, when we begin the practice of spiritual readings, younger children become squirmy and inattentive, we must not be discouraged. They will soon accept whatever is routinely done and will understand what is said better with time. For Orthodox Christians, every day is dedicated to God. Our earthly concerns must always be secondary to our spiritual concerns. This is what our children must see and experience always. When there is a Feast Day of the Church, the Orthodox family must make every attempt to be present at the services for the Feast. If this means missing school or work, the sacrifice of that time will only help to underline the fact that worship of God is a priority. When, for some reason, it is impossible for the family to attend services on a Feast Day, they should make an effort to either say some of the prayers from the services in their icon corner at home (if they have the books) or teach the children the significance of the feast day and read the appropriate scripture readings from the Bible. At all times, the children should be made aware of festal and fasting periods and what is expected of them during these periods. 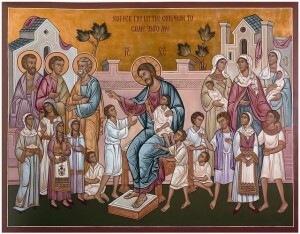 The more they know of the cycle of the Church calendar, the more Orthodox children will feel themselves to be a part of the greater Body of Christ. To be honest, the atmosphere which prevails in the average public school is not exactly conducive to promoting civilized behavior, much less Christian conduct. The greater part of what the Orthodox parent tries to convey to the child at home will be quickly unlearned at school because of the child’s desire to fit in with the herd. Hypocrisy and shame will often have the child leading a double life if the parents are not extremely vigilant and careful. Ideally, Orthodox children should be schooled at home but the ideal is not always attainable. Accordingly, here are some guidelines for helping a child maintain his identity as an Orthodox Christian within the public school system. 1) Have your own dress code and enforce it. Children express their identity by their outward appearance. Many inner city school are moving to curb gang involvement and discipline problems by issuing uniforms and banning make-up and jewelry. Thus far these methods have proven quite successful. Even if your child’s school has not instituted such regulations, you should insist that your child be attired modestly and without unnecessary adornment. Girls should be wearing dresses or skirts. If for the sake of modesty, a girl needs to wear shorts, they may be worn under the dress. The use of hairspray and the wearing of boyish or distracting hairstyles should be discouraged. Boys should be wearing clothing that fits them properly and should have their hair properly trimmed. There is a mistaken notion among some Orthodox Christians that boys who serve as candle-bearers or readers must wear their hair long as a monk or priest does. This is not true and should not serve as an excuse on religious grounds to violate existing school dress codes. 2) Emphasize the importance of keeping fasts at school. Temptations will be many and will come not only from the child’s peers but from teachers who want to treat the children (almost always on a Friday). Provide tasty sack lunches on fast days. It is not usually too difficult to give the child something more desirable than the usual cafeteria fare. Bring fasting treats to school parties which are held during a fast period. Let the teachers know about Orthodox fasting practices at the beginning of the school year so your child will not experience discomfort at having to explain concepts he may be unable to articulate. Above all, let your child know you are proud of him when he has refused something he would like to have eaten. He will remember that encouragement when future temptations arise. 3) Make the child think always in terms of acting as a Christian and pleasing Christ with his behavior. If the child does something wrong at school, he should admit it and be willing to take the consequences. A child who blames others for his behavior or lies to escape punishment is developing a pattern of moral cowardice. A parent who blames others for the child’s behavior (The teacher doesn’t like him. It was the other kid’s idea. He just went along), or shields the child from the fair punishment he deserves is training him to be a moral coward, or perhaps training him to be immoral. Encourage the child to forgive the children who wrong him and tease him. Help the child to try and see things from the perspective of the teacher who always seems so grumpy and hands out so much homework. Never give the child an excuse for not meeting their obligations at school. If he misses class to attend Divine Services, make it clear that he must make up the work. Try to have a good relationship with the teacher so that if problems arise, the communication lines are open to discuss them. 4) Teach your child that he must never be ashamed of being an Orthodox Christian. Wearing a cross, saying a blessing before eating, refraining from blasphemy or cruelty, these are all things which set him apart from an unthinking crowd of young people who have no idea who they are. Do your best to convince him that confusion and fear of ridicule are not enviable motivations for living. As a parent, do not be deceived into believing that the school owns your child or has any right to dictate to you how your child should be educated or what values he should be learning. If the school is offering a course which you find morally objectionable, have your child excused. If the school will not excuse your child from the course, withdraw your child from the school. Whether or not you choose to argue the merits of a particular class, your child should not be subjected either to morally questionable material or to the ensuing controversy should you decide to fight to have the material removed. Specifically here, we are referring to homes of non-Orthodox friends, though some of the ideas deal with manners which would apply in anyone’s home. Most Orthodox Christians in America do not live in Orthodox communities. Our children will undoubtedly have friends who not only know nothing about our religious beliefs but know very little about any kind of religious beliefs. Even the idea that our children may not be allowed to do whatever they want to do whenever they want to do it may leave them incredulous. If we tell our children that they may only associate with those people whose values are identical to our own, they may be waiting a long, lonely time for such people to appear. What is more, they will either develop into unbearably self-righteous judgemental prigs or they will reject us as such. 1) The child should act in the homes of others as he does in his own home. That is, he should be obedient to the adults in authority, ask permission, and respect the property of others. 2) The child should not judge non-Orthodox people by Orthodox standards. They do not sin when they do not fast on a Wednesday or a Friday. The child need only remark about Orthodox fasting rules in reference to himself when offered something he may not have. If there is good communication between Orthodox parents and their children, visits by the children to their friends’ homes should not be a source of anxiety. The world is a strange place, however, and we sometimes do well to err on the side of caution. Be sure your child tells you if anything goes on in the home which is disturbing to him and act accordingly. Serious problems, such as drunken or out of control adults on the premises, require that the child not be allowed to visit the home. Lesser problems, such as the family saying no blessing before they eat, require that the child learn to say a quiet blessing for himself and remember his friends in prayer that they may ultimately come to know God. In some homes, television is watched rather indiscriminately and music is played which contains some rather vulgar or even blasphemous lyrics. If your child has been brought up in the proper atmosphere of piety and has developed a real appreciation of beauty, he will be repulsed by these things. Depending on the circumstance, the child should be encouraged not to spend play time watching television with his friends. But if the friend watches only family type programs, it will do no harm to allow the child this form of occasional entertainment. If, however, these friends seem to spend all their time in front of the set, or they encourage your child to watch objectionable shows or listen to inappropriate music, then these are not friendships worth cultivating. At the same time, we need not insist that the child leave the house just because an older brother of the child’s friend listens to rock music in his room or the parents watch a questionable sitcom in the den while the kids are playing in another room. Let him take his leave only when he is placed in uncomfortable proximity to the disturbing imagery. If the child’s friends lead him into unruly behavior by their example and he is unable to resist the temptation to act as they do, then it is time to deny permission to the child to spend time with such friends. A child cannot learn too soon that being led into sin by one’s friends can result in negative consequences. This lesson, among others, helps build a child’s strength of character and individuality. Ideally, the Orthodox Christian family should spend some vacation time each year at an Orthodox monastery or convent. These visits are especially important in helping children establish positive role models and sparking in them an interest in monasticism. For all Orthodox Christians, monastics represent a spiritual ideal which help us to put into perspective the very few sacrifices required of us as lay people. When children see monks and nuns acting in obedience and humility, being of cheerful service to others, and gladly spending long hours in prayer, they understand much better the attitudes and actions required of them. Of course, we always hope that some of these children will decide to become monastics themselves but it would be unrealistic to expect them to evince such a desire if they have not had the opportunity to see this life for themselves. Whatever sacrifices of time and money it may require, a visit to an Orthodox monastery or convent should be a priority for every Orthodox family. Of course, there are other types of vacations. Those taken with the family are not so much a problem for Orthodox children. The family will naturally say morning and evening prayers together and keep the fasts wherever they are. But what about vacations spent with non-Orthodox or nominally Orthodox relatives? 1) That he child not be harassed about any aspect of his faith. Make it clear that negative remarks about fasting, prayer, the child’s traditional appearance (i.e. a girl not being allowed to wear pants), the child’s interest in monasticism, etc. constitute harassment and will render another visit by the child to this relative improbable. 2) That the child be allowed to fast on fast days. Peanut-butter sandwiches and fruit are perfectly acceptable. It should never be implied that the relative go to great expense or trouble to entertain a fasting child. This is another area where it will stand the child in good stead if he has learned not to complain about food. 3) That the child be allowed to attend Church on Sundays, if possible. This needs to be gauged by the individual parent. If the relative is not Orthodox and lives far from an Orthodox Church, perhaps it would be better for the child to say his prayers in the relative’s home. If the relative is Orthodox but considers vacations to be time off of Church, one can afford to be more insistent as the example is a terrible one for the child. Equip the child with the necessary prayer books, icons, and prayer rope so that he will have no excuse to miss saying prayers and remind him that the relatives will only take his religion as seriously as he does. Do not encourage him in judging his relatives or treating their beliefs with disdain. The more truly Christian he acts, the more interested in Orthodoxy they will be. There are no guarantees that applying any of the above suggestions will result in our children remaining in the Orthodox Church into adulthood. This is a sad fact but one which must be faced. We live in difficult times and our children face myriad temptations. We cannot ultimately force Orthodoxy upon them. They must choose it for themselves. We are, however, accountable for what kind of teachings they receive during their formative years. If we have done our job, the chances are greater that they will remain Orthodox or, if they leave the Church, that they will come back. They will not come back because they like us so much or because we filled every minute of their childhood with fun. They will come back because their hard experience in the world will teach them some respect for our strictness and because we told them the truth even when it hurt. There can be no other definition of love for a Christian than a sincere desire for someone’s salvation. The love we bear our children must be according to that definition at the expense of any other which the world may try to impose upon us. Is it remarkable that there are so few who are being saved among those who have led a bad youth? This example more clearly than anything else indicates in what great danger is a person who has not received good rules in his youth and has not beforehand dedicated himself to God. This monograph was originally published by the Center for Traditionalist Orthodox Studies. It is available for order.